We are all very excited here at Saxquest about the March Local Saxophonist Showcase. Many of us that work here have studied saxophone and doubles with Mike Karpowicz. He is often so busy playing doubling gigs at the Muny and the Fox, that many haven’t had the chance to hear him in a quartet setting playing Jazz. You defintely won’t want to miss this month if you haven’t had a chance to hear Mike play yet. This event is free and open to the public, and will be at the main Saxquest location on Saturday, March 18, from 2pm – 4pm. Mike Karpowicz is Director of Bands at DeSmet Jesuit High School where he established the school’s first instrumental music program. He teaches Concert Band and four jazz ensembles. 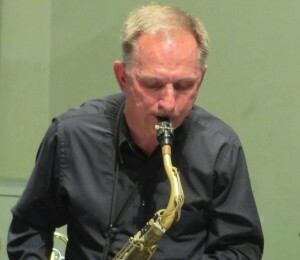 He is also an adjunct faculty member at Webster University where he has taught Applied Saxophone, Saxophone Ensemble, Woodwind Methods and Jazz Combo.